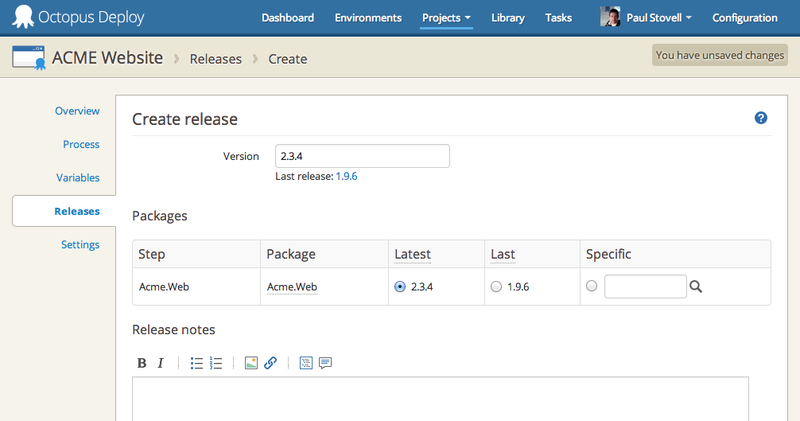 Channels has shipped in Octopus 3.2! 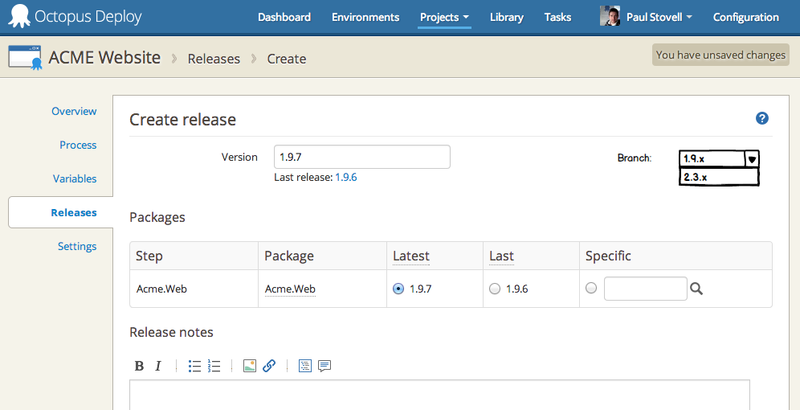 In the next version of Octopus we're planning to improve our support for people working on different branches of code. We're still in the planning stage on this one, so it's a good time to share what we're doing and get your comments. When viewing the create release page, since Octopus defaults to the latest version, it means people have to hunt to select the right package version - not a great experience. A branch has a simple name, and then a set of rules that decide which versions should appear when creating a release. In the Step name field, you can choose which steps to apply the rule to - one, many or all steps in the project. The Version range field uses the NuGet versioning syntax to specify the range of versions to include. The Tag can contain a regex, and is used over the SemVer pre-release tag. Here, the project has multiple steps. For the Acme.Util step, we have one rule, and we have a different rule for the other steps. We're using tags to only show packages with the -vnext SemVer tag. Our goal with this feature is to keep it simple - branches really only matter from the perspective of the release creation page (and Octo.exe create-release). If you need different environments or deployment steps depending on the branch, it's probably best to clone a project. So, what do you think? Would such a feature be useful to you? Let us know in the box below.